After capturing the Big East tournament title, Villanova is looking like a real threat to repeat as national champs. But just how good is the conference as a whole? A year ago, the Wildcats didn’t have to worry about manufacturing motivation entering the NCAA tournament. A loss to Seton Hall in the league tournament title game provided the wakeup call they needed to enter March Madness with a sense of urgency that served as a buffer for the sort of early-round lapses that doomed them in two previous seasons. This year, with a conference tournament championship and another dominant regular-season under its belt, Villanova is cruising into the Big Dance. Its performance this week suggested it’ll moonwalk once it gets there; anything other than a smooth glide past its first couple of opponents would be surprising. “Play our way, and then good things will happen,” Bridges said, in a terse encapsulation of what neither Creighton, Villanova’s opponent in the Big East Tournament final on Saturday, or the teams who draw the Wildcats in the NCAAs can dispute. Villanova, at its best, is going to be incredibly difficult to beat. And so, a postseason event that began Wednesday with an imbroglio giving off old Big East vibes concluded with an affirmation of the status quo in the new Big East. The Wildcats routed the Bluejays, 74–60, here Saturday to win the conference tournament and further their bid for the top overall seed in the NCAA tournament. The victory offered more proof of Villanova’s very real potential to make another deep run in college basketball’s marquee event, a year after it won it all thanks to one of the greatest shots in the sport’s history. Whether the Wildcats needed such proof is a matter of debate. They no doubt had motivation to win here after falling to the Pirates in the title bout last March, but even a quarterfinals bowout would not have meaningfully altered the sense that Villanova increasingly looks capable of finishing this season the way it did the last one. This is nothing new for the Wildcats, the rousing fan ovations and trophy ceremonies and instantly distributed celebratory gear: They’ve won half of the Big East’s tournaments since its reformulation as a hoops-only confederation prior to the 2013–14 campaign, and all of its regular-season titles. Villanova’s run this week was a continuation of what took place from November through March. The Wildcats mowed down their opponents without much fuss, save for a determined push from Seton Hall in the semifinals. In that case, though, coach Jay Wright laid the blame at his own feet. “I think we got outplayed tonight,” he said afterward. Villanova’s two other wins were clinical demolitions. A day after St. John’s coach Chris Mullin got into in a heated exchange with Georgetown coach John Thompson III that evoked the Big East of yore, his team got run off the court by the undisputed kingpin of the conference’s current era. In one of their most impressive offensive performances of the season, the Wildcats blitzed the Red Storm with 21 threes and rang up 1.59 points per possession. Lofty preseason expectations are a burden every highly ranked program must manage one way or another. There is pressure, albeit manufactured by media members, to meet a certain standard. For reigning national champions, this pressure is even more onerous, because any dip in performance, no matter its longevity, prompts referenda on their viability to repeat. The best thing you can say about 2016–17 Villanova is that there wasn’t much to say about it at all. The Wildcats went about their business with the self-assured calm of a team fully in control of everything happening around them, a Tesla operating on Autopilot. From its season-opening 40-point win over Lafayette in November to its 14-point victory against the Bluejays here this weekend, Villanova generally gave off the impression that it knew exactly what it was doing and how to do it. The Wildcats should enter the NCAA tournament as the No. 1 overall seed, with 31 wins, the top Rating Percentage Index in the country, a No. 2 ranking on Kenpom.com, No. 1 ranking on KPI Sports and the nation’s fourth-highest point differential when adjusted for strength of schedule. As it waits to hear its name called on Selection Sunday, the only source of drama for Villanova is which teams will be slotted below it in the East region. Getting here should not have been this easy for the Wildcats. They opened the year needing to account for the departures of two vital contributors from last year’s championship team, Final Four Most Outstanding Player Ryan Arcidiacono and starting big man Daniel Ochefu. There was no simple plan for replacing Arch’s shooting, playmaking and leadership, or Ochefu’s rim protection and rebounding, but Villanova could at least use the off-season to prepare to make do without them. By contrast, the Wildcats lost their most highly regarded incoming recruit, center Omari Spellman, to an eligibility ruling in September, less than two months before their opener against the Leopards. Four games into the season, another projected key contributor, junior guard Phil Booth, who paced Villanova with 20 points in the title game last April, was ruled out with a knee injury from which he has not fully recovered. Booth hasn’t logged a minute since November. But neither of those two personnel hurdles fazed Villanova before Big East play, as it rolled into January having downed Big Ten champion Purdue in West Lafayette, Ind., likely tourney invitee Wake Forest in the Charleston Classic and ACC contender Notre Dame on a neutral court in Newark, N.J., as part of a nonconference schedule rated more difficult by adjusted efficiency margin than all but two other top-25 Kenpom squads. The Wildcats followed up by breezing through the Big East, a top-three conference nationally according to Kenpom, with only three defeats, marking the first time they suffered more than two since the inception of the “new” 10-team version of the league in 2014. Their success cannot be attributed to any one factor. It’s a product of seismic leaps by several players, Wright’s stewardship and the cohesion established among players on the road to cutting down the nets a year ago. Hart evolved from a co-star to the captain of the national player of the year race for most of the season. Sophomore point guard Jalen Brunson, in defiance of the narrative weight placed on the group of NBA-track freshman point guards around the country, ably took up the top spot on the PG depth chart vacated by Arcidiacono by increasing his shooting percentages, getting to the line more often and slashing his turnovers while increasing his assist rate. And Donte DiVincenzo, who played in only eight games as a freshman in 2015–16 before breaking his foot, made baby steps toward chipping away at the absurdity of his nickname, “The Michael Jordan of Delaware,” by providing valuable backcourt minutes alongside Brunson. The Wildcats have been marginally better on a per-possession basis offensively, thanks in part to improved shot-making from inside the arc (they made 61% of their twos against Big East foes), which helped offset their sub-par two-point field goal defense and inability to consistently clear the defensive glass. While it’s plain that mentality has paid off, the most challenging part of the journey lies ahead. Villanova reached the college hoops summit last year by unleashing a relentless offensive assault (50% three-point shooting, 63% two-point shooting, 1.28 points per possession) over six games, one that reduced Oklahoma's Buddy Hield to an innocent bystander in a 54-point Final Four rout. The Wildcats can’t count on that happening again. But it’s reasonable to argue that they’re the squad best positioned to win consecutive championships since Florida in 2006–07. Even if they fall short, though, their path to this point has been uncharacteristically steady. How good is the Big East, really? Arguments about conference strength are frustrated by one fundamental problem: There’s no consensus on the ground rules. Depth is important, sure, but so is top-tier quality. And even if there’s agreement on how much those two elements should be considered, the unit of measurement is another major issue. Ken Pomeroy’s efficiency rankings, Jeff Sagarin’s ratings, the RPI and NCAA tournament bids are just a few of a raft of options. Pretty much any of them can be used selectively to portray certain leagues in a positive light at the expense of other leagues. Yet this year, one contention in the annual intra-conference shouting match for which there seems widespread approval is that the Big East, a high-major league without a seat at the Power 5 table, is good. The East Coast-based alliance is poised to send seven teams to the NCAAs, a number likely ensured by Xavier’s win over Butler in the quarterfinals here. The Big East’s other projected tourney representatives: Villanova, Creighton, Seton Hall, Providence and Marquette. The conference didn’t garner a lot of national attention for its top-to-bottom strength during the regular season, in large part because of the ACC’s collection of title threats (UNC, Louisville, Duke, Virginia) and the Big 12’s analytics-backed case as one of the best leagues in recent memory (its efficiency margin of TK is the largest since the ACC’s + 19.92 in 2004, according to Kenpom.com). That should change by the time Greg Gumbel reveals the final member of the Big East’s septet headed to the big dance less than 24 hours from now. The conference’s 70% success rate on tourney qualification would be the best in its four year history, including when six of its squads got in two years ago, and also better than the old Big East’s record 11-for-16 showing in 2011. The likelihood of a 7-for-10 output this year seemingly bespeaks the league’s durability and vigor in its current iteration. Even longtime fans yearning the bygone days of Calhoun and Boeheim and Thompson Jr. have to admit: The Big East is doing pretty well for itself. Upon closer inspection, however, it’s worth asking whether we ought to pump the breaks on lauding the Big East as a historically great conference on account of its tourney bid quantity. To be sure, it’s folly to doubt the credentials of the league’s best outfit. Villanova has an ironclad case as a No. 1 seed, and it might well be the best team in the field. There’s also Butler, which is on track to earn a spot on the four- or five-line even after suffering a surprising loss to sputtering Xavier in the quarterfinals this week thanks to its assortment of quality wins and its apparently limitless supply of ‘Nova Kryptonite. And it would be a mistake to dismiss Creighton, which weathered a season-ending injury to its best player (Watson Jr.) to mount a run at a top-six seed. Still, the rest of the Big East’s group of likely tourney representatives is verifiably meh. Seton Hall, Providence, Xavier and Marquette all could wind up as 9-10 seeds or lower, if not out of the bracket altogether. Those four teams look safe, but they’re hovering in that bubble danger zone where a surprise inclusion or two from the committee, like Tulsa a year ago, could relegate one of them to the NIT. Getting a lot of teams into the NCAA tournament is a big deal, but that number shouldn’t be dispositive when it comes to appraising conferences. Take the Big East of 2014–15, which had only one of its six tourney teams placed below a No. 6 seed, with those six squads posting an average efficiency margin of + 19.95. If we assume the Big East will deliver seven teams to the NCAAs this year, it seems certain that only two of them will be slotted as No. 6 seeds or higher (Villanova and Butler), and those seven teams’ average efficiency margin would come out to + 18.75. To get a better idea of where this year’s Big East stacks up against other conferences, let’s consider a metric used by John Gasaway called seed points, which assigns four points for every No. 1 seed a league earns, three for every No. 2, two for every No. 3 and one for every No. 4. The Big East’s best-case scenario in 2017 is five seed points. A conservative estimate for the ACC this year is 11. In 2009, the Big East earned 16 (yes, it was bigger back then). These comparisons are not meant to diminish the 2016–17 Big East’s standing, only to provide context around the acclamations you’ll probably hear from pundits tomorrow. It’s possible that we’ll look back on Selection Sunday and say that it didn’t tell us much of anything about how good the Big East is. If six of the league’s seven tourney teams get bounced in the round of 64, but Villanova wins it all, that could be framed as both a validation and indictment of the conference’s value. Conversely, all seven squads could reach the second weekend, but if neither the Wildcats nor the Bulldogs or anyone else from the Big East makes it to Phoenix, one could argue that the conference didn’t perform well on the biggest stage. Ultimately this matter won’t be resolved in the foreseeable future. A decisive outcome in the best conferences debate feels remote because there probably isn’t a right answer. There are only differing interpretations of a mountain of statistics and results and first-hand accounts from players and coaches and other pieces of evidence. The Big East has looked pretty great in 2017, and that notion probably will be reinforced tomorrow. But drawing a conclusion based solely on tourney bids is misguided. When trying to gauge a league’s place in the national and historical league hierarchy, the best course of action is to dig deeper. As Seton Hall knocked down a parade of free throws in the waning moments of its six-point win over Marquette in the quarterfinals on Thursday, it was difficult to muster much confidence in the Golden Eagles as an NCAA tournament team. With the selection show only a few days off, Marquette was showing up as nine or 10 seed in mock brackets despite not doing that much to recommend it. The Golden Eagles had failed to crack 20 victories even while playing a tissue-soft non-conference schedule and they won only two more games than they lost in conference play. A neutral court conquest over Vanderbilt, a pair of Ws against Xavier and Creighton teams missing their respective star point guards due to injury and an upset of Villanova stood as the shiniest bullet points on their résumé. For the vocal pack of college basketball observers lamenting the state of the bubble this year, Marquette offered prima facie evidence of the exceedingly low level to which the committee is stooping to fill out the field of 68. But if you’re looking for a lower-seeded team to pick to slay a powerhouse in the first round, you should try to ignore all of that once you start breaking down matchups. The Golden Eagles are really compelling as an upset pick. This probably feels like a bad idea, for a couple of obvious reasons. For one, Marquette’s recent track record doesn’t suggest it can pull off this sort of thing. The Golden Eagles have dropped six of their last 11 games, including one at lowly St. John’s, and they were just soundly beaten by a pedestrian Seton Hall team that really labors to score from both sides of the arc. For another, the underdog allure of mid-majors makes them more attractive options for first-round gambles. It’s not worth burning one of my daring opening-round picks on an uninspiring big six league team, one might say, when there are small-league schools that 1) will be more fun to cheer on against a well-heeled juggernaut and 2) have a better chance to actually, you know, win. Those are valid points, but they’re outweighed by the trait that makes Marquette a serious threat to sow bracket chaos. The Golden Eagles shoot a lot of threes, and a lot of them go in. 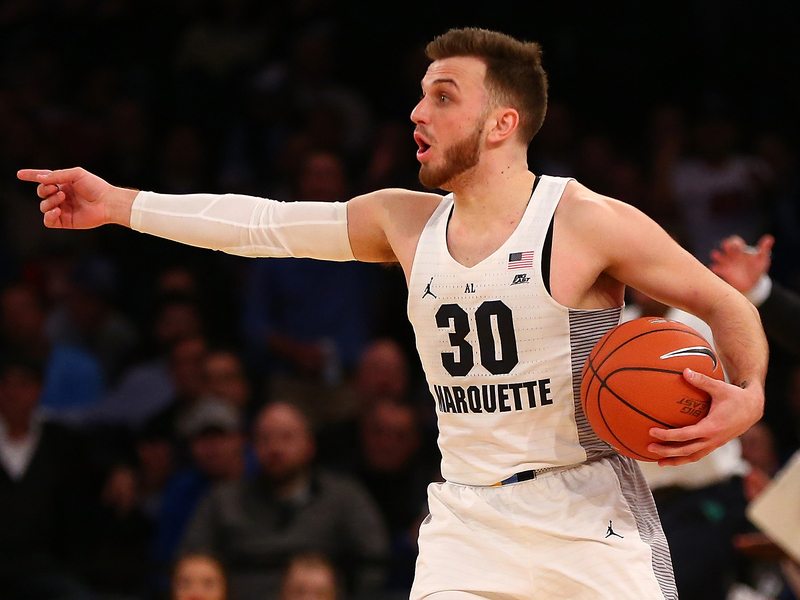 Marquette features five players who’ve knocked down at least 36% of their treys on more than 70 attempts this season, including three who’ve sank at least 45% on more than 130 attempts (UNC-Asheville transfer guard Andrew Rowsey, and freshmen Markus Howard and Sam Hauser). As a team, it leads the nation with a 43 3FG%, and since inserting Rowsey into the starting lineup in the middle of February, the Golden Eagles have hoisted 45.2% of their field goal attempts from deep, which would rank in the top-20 nationally (and higher than every other high-major squad) if sustained over the entire season. They also rank second nationally (behind only Iowa State) in catch-and-shoot jump shot efficiency at 1.3 points per possession, and in the 99th percentile on both spot-up situations and in transition opportunities, according to Synergy Sports data. Marquette roasts opposing defenses by spreading the floor with three or four snipers around primary big men Luke Fischer and Matt Heldt. If the Golden Eagles get hot, they’re really hard to beat. “You’ve got to pick your poison with them,” Willard said. “You’re either going to let—give up some twos or you’re going to get killed by the three.” This emphasis on long-range marksmanship is not encoded into coach Steve Wojciechowski’s strategic DNA. During his first two seasons in charge in Milwaukee, Marquette took 35.4% and 30.3% of its shots, respectively, from beyond the arc, which ranked 137th and 286th nationally. This season’s shift toward the perimeter is an excellent example of a coach adapting his strategy to suit personnel. The addition of Rowsey, coveted recruits Howard and Hauser and USC transfer Katin Reinhardt infused Wojciechowski’s rotation with so much long-range firepower that eschewing a three-heavy offensive focus would have felt like tactical malpractice. Any hesitation to buy into the Golden Eagles, even with their proven capacity to rain fire from 21 feet and out, is understandable. A starting backcourt of Rowsey and Howard, while potent offensively, is asking for trouble on the opposite end; both undersized guards (Howard is 5’11", Rowsey is 5'10") have registered negative figures in defensive box plus-minus, and Marquette yields .17 PPP more with Rowsey on the floor than when he sits, according to Hoop Lens data. Plus, Marquette doesn’t compensate for its undersized backcourt with a group of perimeter stoppers or an elite rim protector. Teams hit just over half of their twos against the Golden Eagles, good for 216th nationally, and they’re vulnerable on the defensive glass, allowing opponents to pull down 29% of their misses. Marquette bled 110.6 points per 100 possessions during Big East play, better than only DePaul among teams in the conference. The Golden Eagles can get buckets without breaking a sweat, but they’ve also proven unable to offer sturdy resistance when manning the other half of the court. And if its shots aren’t falling, Marquette won’t have an effective counter against a top-shelf opponent. That said, Marquette’s potential to bury whomever it draws in the first round in a pile of triples and win a high-scoring game is manifest. It employs a high-variance attack that, if kicked into overdrive, is potent enough to vanquish any team slotted on the one or two line. That possibility should be enough to convince you to take a flier on the Golden Eagles.